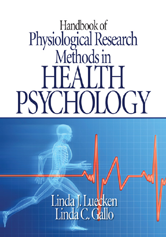 Editors: Luecken, Linda J. and Gallo, Linda C.
The Handbook of Physiological Research Methods in Health Psychology provides thorough, state-of-the-art, and user-friendly coverage of basic techniques for measurement of physiological variables in health psychology research. It is designed to serve as a primary reference source for researchers and students interested in expanding their research to consider a biopsychosocial approach. 16. Measurement of Sleep by Polysomnography - Martica Hall, Michele L. Okun, Charles W. Atwood, Daniel J. Buysse and Patrick J. Trollo, Jr.